After churning out two successful hard-hitting dramas last year ("Erin Brockovich" and "Traffic"), Academy Award-winning director Steven Soderbergh decides to have some fun with his latest film, "Ocean's Eleven". 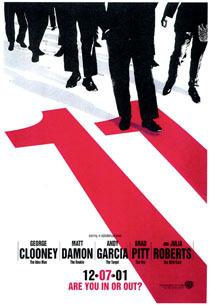 A quintessential caper flick, "Ocean's Eleven" is a remake of the 1960 'Rat Pack' film that featured Frank Sinatra, Dean Martin, and Sammy Davis Jr. However, thanks to the astute direction of Soderbergh, an updated screenplay by Ted Griffin ("Best Laid Plans"), and a charismatic cast, this is a remake that actually surpasses the original. 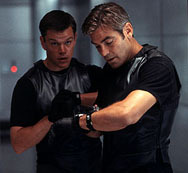 George Clooney (who previously worked with Soderbergh in "Out of Sight") headlines as Danny Ocean, a recent parolee from a New Jersey prison. Upon tasting freedom for the first time in four years, Danny hatches a scheme to simultaneously rob $150 million from three Las Vegas casinos owned by ruthless gambling magnate Harry Benedict (Andy Garcia of "Desperate Measures"). 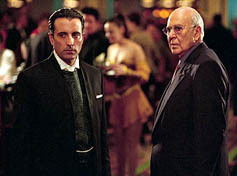 To pull off this caper, Danny brings together a crew of eleven career criminals and con artists: his trusted sidekick Rusty Ryan (Brad Pitt, seen recently in "Spy Games"), casino worker Frank Catton (Bernie Mac of "Get on the Bus"), pickpocket Linus Caldwell (Matt Damon of "All the Pretty Horses"), bankroller Reuben Tishkoff (Elliott Gould of "American History X"), Cockney-explosives expert Bashir Tarr (Don Cheadle of "Swordfish"), techie Livingston Dell (Edward Jemison), old-timer Saul Bloom (Carl Reiner of "The Adventures of Rocky & Bullwinkle"), dim-witted brothers Virgil (Casey Affleck of "Hamlet") and Turk Malloy (Scott Caan of "Boiler Room"), and a Chinese gymnast named Yen (Shaobo Qin). Of course, like all high-stakes heists, Ocean's team of eleven have a number of obstacles to overcome, including a state-of-the-art security system guarding the common vault of the three casinos, guards armed with machine guns, and hundreds of surveillance cameras. And to make matters worse, Danny's estranged ex-wife Tess (Julia Roberts of "America's Sweethearts") happens to be Benedict's new squeeze. 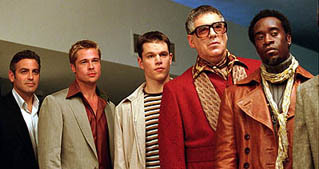 "Ocean's Eleven" may have a few faults, but it is hardly a failure. On the positive side, this updated version spends a large part of its time on the fascinating and fun mechanics of the caper. And like last month's "Heist", the clever script manages to always stay a few steps ahead of the audience with its numerous twists and ingenious use of misdirection. 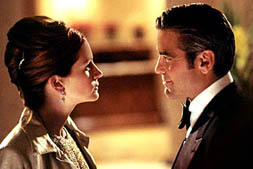 The big-name actors that Soderbergh has gathered for "Ocean's Eleven" (which is undoubtedly a testament to the veteran director's reputation) make a charismatic ensemble, and are given plenty of juicy bits of dialogue to chew on. And like Soderbergh's underrated "Out of Sight", the pacing and tone of this latest film is upbeat and snappy, with the director's own cinematography and soundtrack choices giving it a cool retro-Sixties/Seventies milieu. However, on the flip side, with such a large ensemble to take care of, there isn't a whole lot of running time to develop the film's characters, with Robert's Tess, Cheadle's Tarr, and Qin's Yen being the most shortchanged. The humor is also a bit sparse, and at times, the focus on procedure and the minutiae of the operation make "Ocean's Eleven" approach the dryness of "Traffic". Finally, while the plot twists do not get outlandishly implausible, there are a few moments that do stretch the audience's goodwill. "Ocean's Eleven" will probably not land Soderbergh any Academy Award nominations or trophies this year, which is beside the point. Instead of returning to the serious-minded dramatic territory in which he has built his 15-year Hollywood career on, Soderbergh has opted to kick back with a fun piece of frivolous filmmaking. Good, but not great, Soderbergh has done a commendable job in resurrecting and improving on the original 1960 film, creating a classy and fun caper flick that will offer a couple hours of entertaining diversion.